I’ve had a lot of good yum cha (more commonly known as dim sum) since I have a handful of relatives in Hong Kong, Guangzhou, and NorCal. I didn’t expect too much from Hong Kong Chinese Restaurant’s yum cha, but I was a bit surprised. We ordered the usual stuff: siu mai (燒賣), har gau (蝦餃; shrimp dumpling), cheong fun (腸粉; rice noodle roll). The siu mai was delicious – mostly ground pork with just a bit of shrimp paste. The har gau was pretty decent, and the cheong fun’s noodle skin wasn’t firm enough. Left photo, top plate: shrimp dumplings. 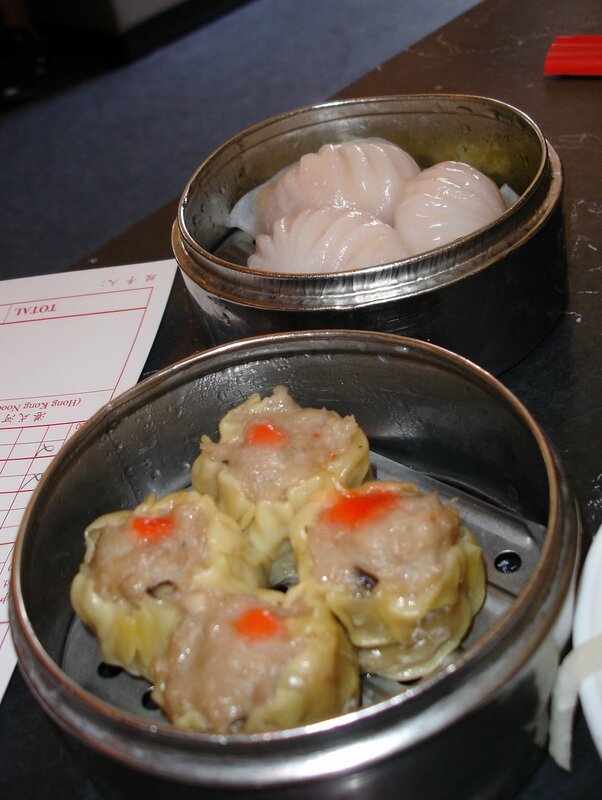 Left photo, bottom plate: siu mai. Right photo: rice noodle rolls. We also tried a plate of the char siu (叉燒; Cantonese barbecued pork), which was very nicely done. Good amount of sauce, and pretty tender meat. Another good dish was their sliced ham (火腿), which was served with red vinegar and diced garlic – these two were probably my favorite. 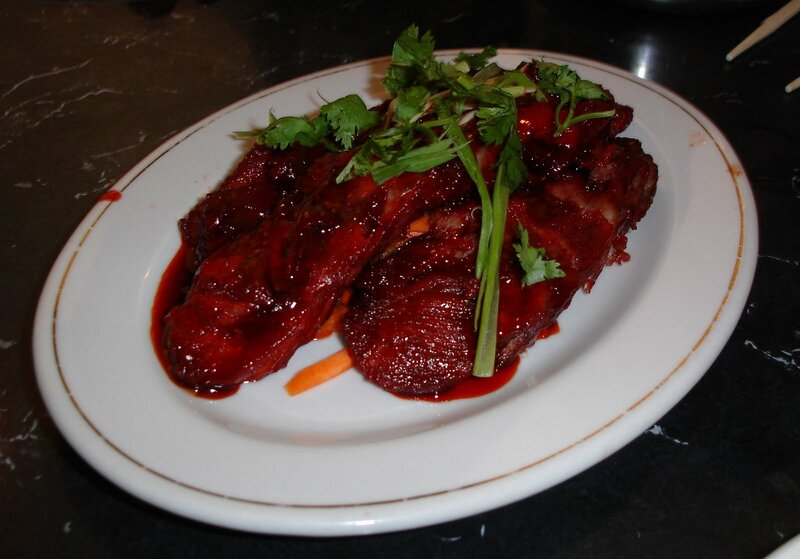 Top: Cantonese barbecue pork. Bottom: sliced ham with red vinegar. 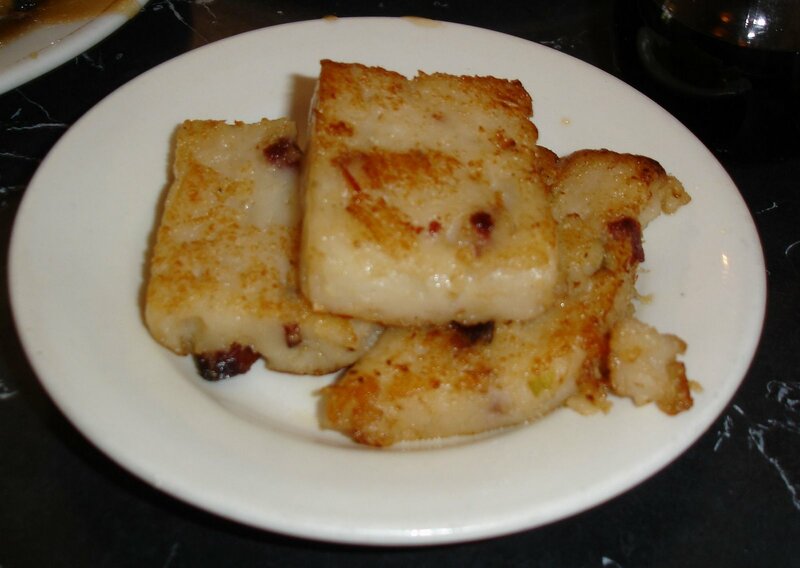 Finally, we also ordered their lo bak go (蘿蔔糕; turnip cake). It wasn’t anything spectacular, but good enough to satisfy a craving. Of course, we had a plate of vegetables, which changes from visit to visit based on freshness and availability. We finished the day with some dessert – matuan (麻糰). Overall, a pretty decent meal. There were some other dishes that were ordered, but I didn’t try enough to give a good enough review. Maybe someone else out there can give them a try and leave some feedback? – Worth it – yum cha is a good choice for Chinese food because it’s not oily, and you can sample many different options. Give it a try, and you’re bound to discover at least one or two dishes you’ll like.